Belize NMS: A relatively moist northeasterly airflow prevails over our area. 24-hour forecast: Sunny with a few cloudy spells today and cloudy at times tonight. A few showers will occur mainly over northern and offshore areas of the country, elsewhere, showers will be isolated. General Outlook: (Monday and Monday night) Cloudy spells with a few showers occurring over most areas. Tonight E-NE 5-15 kts Choppy 3-4 ft ISOLATED SHOWERS, INCREASING. Outlook N-NE 5-15 kts Choppy 3-4 ft A FEW SHOWERS. The waters around Ambergris Caye and our barrier reef this morning are flat calm and the breeze is from the N-NE at 5 mph. Our expected high is 82 f. It's going to be a nice day for anything. A significant change to the weather. Very little easterly Caribbean wind or cloud at present, but there is an unusually strata ribbed high level cloud crossing from the SW at high speed, it is thin and not causing any rain, just a little cloud cover to the sunshine. Looks like today will be fairly sunny, just some thin cloud cover, no rain expected. 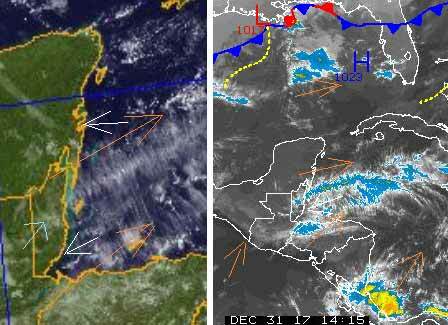 THE MONTH OF DECEMBER ARRIVED WITH A NORTH-NORTHWESTERLY FLOW PREVAILING OVER OUR AREA AS A SURFACE TROUGH EXTENDED FROM NORTHEASTERN HONDURAS TO NORTHERN BELIZE. BY SATURDAY 2ND THE ORIENATION OF THE TROUGH ROTATED AND WINDS BECAME NORTHEASTERLY. AT UPPER LEVELS A RIDGE TO THE EAST OF OUR AREA SUPPORTED A SOUTHWESTERLY FLOW ALOFT. THE RESULTING FLOW AT THE SURFACE AND LOW LEVELS SUPPORTED SOME MOISTURE AND SHOWERS OVER COASTAL WATERS AND ALONG CENTRAL AND SOUTHERN COASTAL AREAS OF THE COUNTRY. RELATIVELY MOIST CONDITIONS PREVAILED THROUGH THURSDAY 7TH. 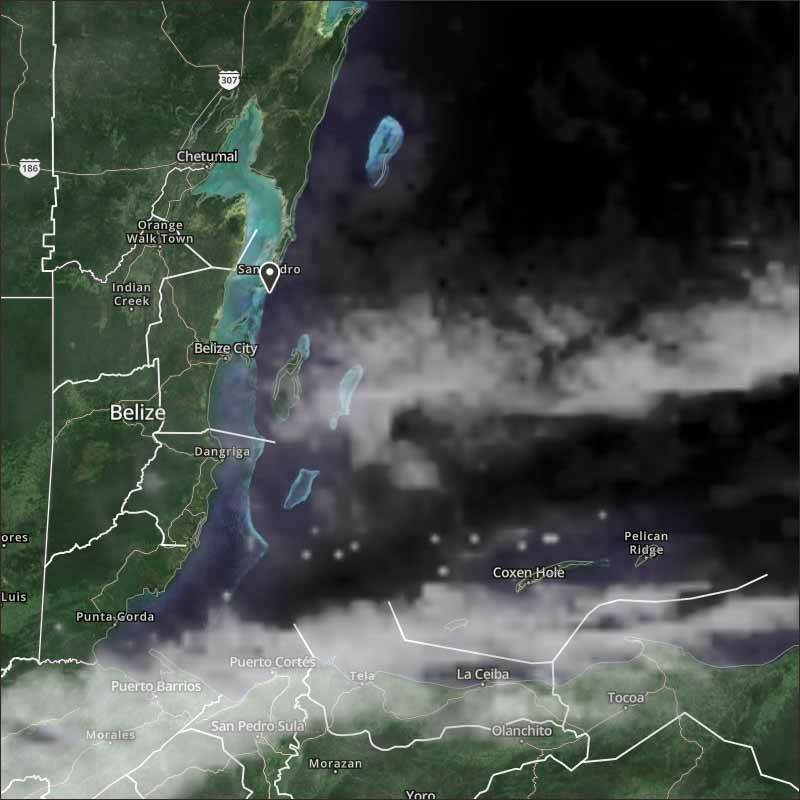 DURING FRIDAY 8TH OVER-NIGHT SHOWERS CONTINUED TO AFFECT SOUTHERN COASTAL WATERS AS A COLD FRONT MOVED OVER THE GULF OF MEXICO AND BAY OF CAMPECHE SOME EARLY MORNING FOG PATCHES AFFECTED RIVER VALLEYS AND LOW LYING AREAS AND CLEARED BY MID-MORNING. UPPER LEVEL MOISTURE AND INSTABILITY INCREASED AS PRE-FRONTAL ACTIVITY IN THE FORM OF A FEW SHOWERS AND ISOLATED THUNDERSTORMS AFFECTED INLAND AND NORTHERN AREAS. THE COLD FRONT CROSSED THE COUNTRY OVER-NIGHT THE 8TH INTO THE 9TH WITH SHOWERY AND WINDY CONDITIONS DEVELIOPING THEN MOSTLY LIGHT RAINFALL OCCURRED DURING SATURDAY 9TH. MAINLY FAIR, WINDY AND DRY CONDITIONS PREVAILED DURING SUNDAY 10TH THROUGH FRIDAY 15TH AS A STRONG RIDGE FROM A CONTINENTAL HIGH OVER THE SOUTHERN UNITED STATES DOMINATED OUR WEATHER AND MAINTAINED THE COLD FRONT ACROSS CENTRAL CUBA TO JUST EAST OF NICARAGUA. 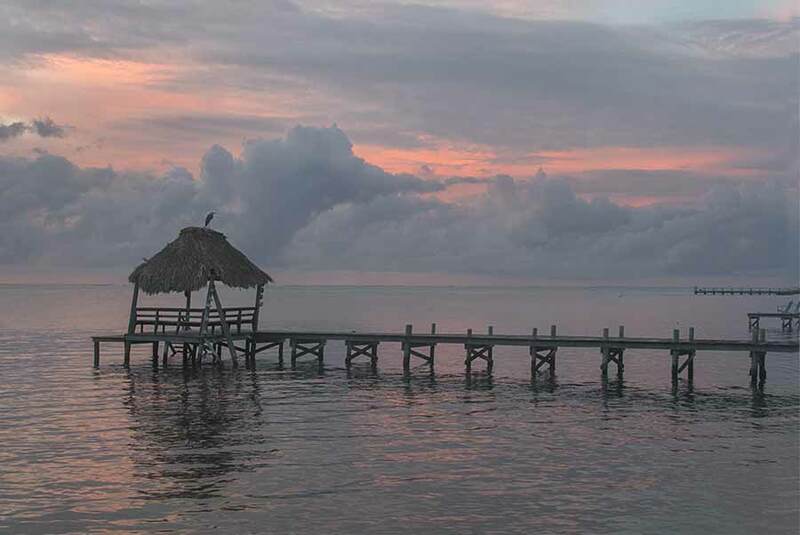 BY SATURDAY 16TH SOME MOISTURE RETURNED OVER OUR AREA AS A SURFACE TROUGH DEVELOPED EAST OF THE COUNTRY TO NORTHWESTERN HONDURAS AND LATER LIFTED TO NORTHERN BELIZE AND YUCATAN, WHILE AT LOW LEVELS A RETURNING EAST-SOUTHEASTERLY FLOW DEVELOPED. BY SUNDAY 17TH A GUSTY EASTERLY SURFACE FLOW DEVELOPED AS THE NORTHERN ATLANTIC HIGH PRESSURE RIDGE EXTENDED TO THE NORTHWESTERN CARIBBEAN AND THE GULF OF MEXICO. MOSTLY LIGHT RAINFALL AFFECTED CENTRAL AND SOUTHERN DISTRICTS DURING SATURDAY16TH THRU MONDAY 18TH. DURING TUESDAY 19TH THROUGH MONDAY 25TH MAINLY FAIR WEATHER PREVAILED AND SHOWERS WERE GENERALLY ISOLATED OVER MOST AREAS EXCEPT ALONG CENTRAL AND SOUTHERN COASTAL AREAS AND THE EASTERN SLOPES OF THE MAYA MOUNTAINS WHERE A BIT MORE SHOWER ACTIVITY OCCURRED. EARLY MORNING FOG PATCHES AGAIN AFFECTED RIVER VALLEY AND LOW LYING AREAS AND THESE CLEARED BY MID-MORNING DURING WEDNESDAY 27TH. THROUGH THURSDAY 28TH A MEANDERING FRONTAL SHEAR-LINE WAS OVER COASTAL WATERS AND THE NORTHWESTERN CARIBBEAN. LOW LEVEL MOISTURE WAS CONFIINED TO A SHALLOW LAYER BELOW 850HPA/5,000FT AND A FEW LIGHT TO MODERATE SHOWERS AFFECTED MOSTLY SOUTHERN COASTAL AREAS WHILE WEATHER CONDITIONS CONTINUED GENERALLY FAIR OVER MOST OTHER AREAS. A NORTHEASTWERLY SURFACE -LOW LEVEL FLOW DURING FREIDAY 29TH AND SATURDAY 30TH ADVECTED SOME MOISTURE AND A FEW SHOWERS ACROSS THE CENTRAL AND SOUTHERN DISTRICTS. A SHORT SPELL OF EARLY MORNING FOG DEVELOPED DURING THE MORNING OF SUNDAY 31ST WHILE SHOWER ACTIVITY WAS GENERALLY ISOLATED OVER MOST AREAS OF THE COUNTRY.